As I grew up and began to earn my own allowance, I would buy my own junk food. I would eat bar after bar of chocolate in front of the TV. My skin was horrible, my hair fell out, and I was fat. It took me 31 years of my life to finally realize that a healthy lifestyle is simply building a new habit. Instead of being in the habit of starting my day with sugary coffee and biscuits, and ending it with a bag of chips and a chocolate bar, I would get into the habit of starting my day with lemon water and a papaya, and ending it with a tub of Greek yogurt and fruit. After three weeks of no processed, sugary, salty, greasy food, my taste buds changed. I no longer had a craving for junk food. My body adapted to a new norm, fresh fruit, fresh veggies, complex carbohydrates and water. Instead of the usual candy bar in my purse I kept dates in case I got hypoglycemic while shopping or craved a caramel frappuccino. I remember after a month on my new lifestyle I was at a family gathering. Out of habit, I poured myself a cup of tea and added a lump of sugar. Having not had sugar for a month I took a sip and spit it out. It tasted horrible! Like nothing but sugar and water. I was shocked that this was something I used to drink in high quantities. Now I’m not saying I never eat any cake or biscuits anymore. But I would much rather enjoy the fruit. On some occasions I will have the slice of birthday cake and I will enjoy it to the fullest and I will not guilt myself afterwards. “I had the cake, now back to eating fresh yummy whole food.” This is what helps me control my eating habits and reach a point where I’m literally in love with the food that I’m putting into my body, because it’s healthy, nourishing and refreshing. It also tastes yummy. Now instead of scolding myself I praise myself: “You are awesome! You are beautiful! You are glowing.” I am now the happiest I’ve ever been. Trust me, if you change your eating habits and not think this is a diet of restriction but in fact it’s a lifestyle of abundance, you too will learn to love yourself and the food you are putting into your body. • Cut the akawi cheese into small cubes and soak in cold water for 6 hours, changing the water every hour until all the salt is removed. • Mix the crust ingredients together and rub the dough between your fingers to ensure even mixing. • Preheat the oven to 200ºC with the bottom heat setting. • Mix the butter and kunafa stain together and spread onto the bottom of the pan. • Press the dough into the bottom of the pan. • Meanwhile, strain the akawi cheese and blot it dry with a kitchen towel. • Mash the cheese with the blossom water. • Spread the cheese on top of the crust. • Bake the kunafa in the oven for 45 minutes. 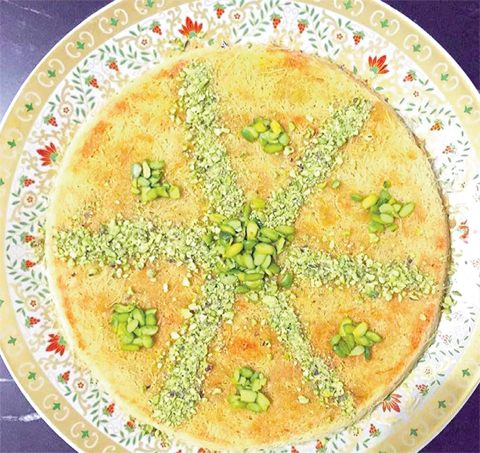 • Loosen the edges of the kunafa and flip onto a serving plate. • Mix the agave with the 1 tbsp blossom water and pour it over the hot kunafa.